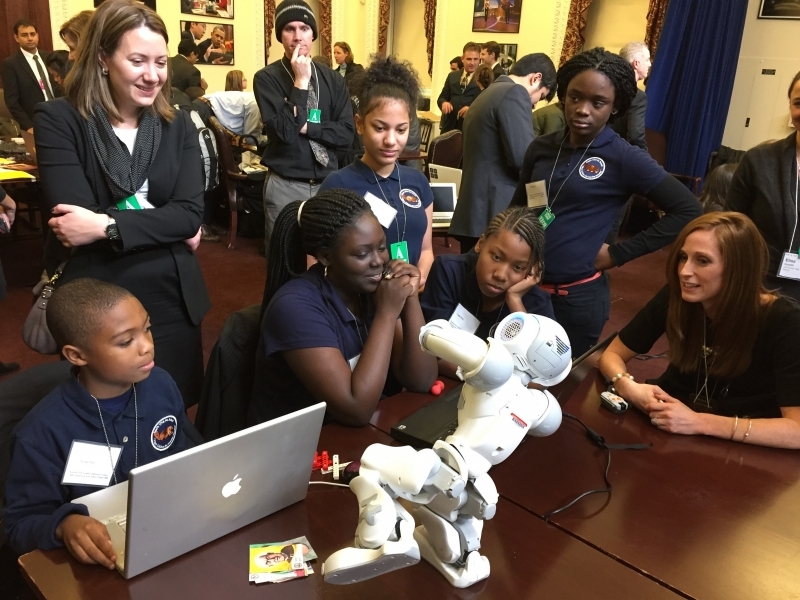 Mechanical Engineering graduate student Bryan Hays and NAO (pronounced 'now'), one of the department's Control Systems Lab robots, took a trip to the White House in December to teach young students the art of programming. Hays, a Ph.D. student with Professor Nikhil Chopra, has been actively involved in the D.C. chapter of CoderDojo—a volunteer organization aimed at teaching 7 to 17 year-olds how to code, develop websites, apps, programs and games, while exploring technology in a creative environment. Hays has volunteered with the group since last fall, and he uses the NAO robot to teach kids how to code. "The kids put together programs on their laptops, and then run the programs on the robot to control his actions and interactions," said Hays. "[They] get to have fun learning. They are encouraged by their ability to build programs in the digital realm and see the robot bring their work to life in the physical world." Hays and fellow CoderDojo volunteers were one of several groups who visited the White House along with approximately 30 school children from New York and New Jersey to participate in "Hour of Code," an online event promoting Computer Science Education Week. The White House participated in the event in "an effort to help support and expand access to computer science education in K-12 schools." While Hays did not have the opportunity to meet President Obama or Vice President Biden, NAO made a cameo in Vice President Biden's Twitter feed. When not visiting the Vice President or working with CoderDojo, NAO is used in the lab at Maryland for teleoperation and other controls related research.